This is the one, the only, Cabo San Lucas Booze Cruise. 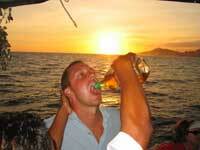 There is no other booze cruise in Cabo San Lucas this wild, this crazy, or this much fun! The FREE ALL-YOU CAN DRINK BOOZE will be flowing throughout the cruise, with dancing, reggae and party music, beer bongs, body shots, and of course, drinking contests! As seen on MTV! If you're here for the famous Cabo San Lucas Spring Break, or just to have a great time and have fun in the sun, this is the tour for you. You'll enjoy beautiful views of El Arco as the sun sets over the Pacific, and have a great time. Get ready to loosen up and get crazy - IT'S PARTY TIME! You may also enjoy the Jungle Cruise by day with our Jungle Cruise Snorkeling Tour, or in whale season, our Jungle Whale Watching Tour. Cruise Passengers: This tour makes a great shore excursion if your ship's schedule allows. It might be too late for some cruise ship schedules! Tuesday through Sunday from 6:00PM to 8:00PM (summer) or 5:00 PM to 7:00 PM (winter). Exact start time will be shown on your confirmation. Please eat before the tour!